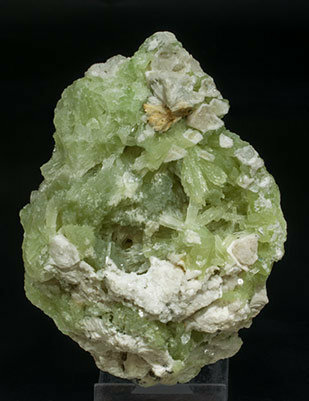 The sample, from the type locality, has divergent sprays of crystals with a clear green color that are partially coated by Calcite and on matrix. Magnificent group of prismatic crystals of excellent size, definition of faces and edges, color and luster. 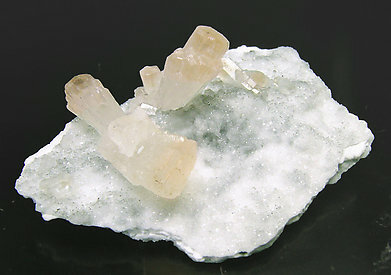 They have marked inner phantom growths and they are on a base of small crystals of Calcite. The specimen is with a label from Filer’s, Redlands, California, that we will send to the buyer. From a very classic locality for the species. 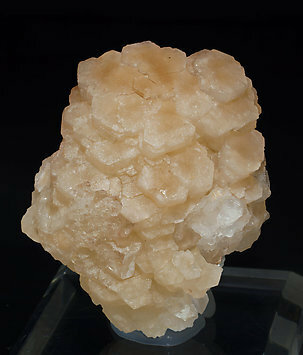 The crystals are very well defined and aerial, with color zoning, deeper on terminations, and on matrix. 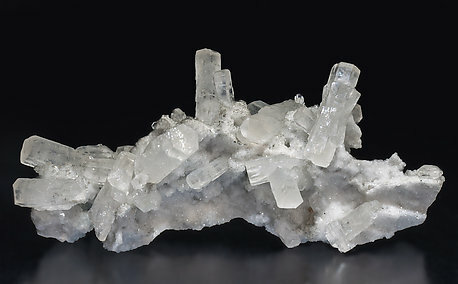 Parallel aggregate, on a Magnesite matrix, of stacked Strontianite crystals with the typical hexagonal twin shape. The crystals are translucent and have a color between pinkish and yellowish. The sample is an Austrian classic and it is with a Franz Lammer collection label with manuscript notes by Joaquín Folch. We will send the label to the buyer. 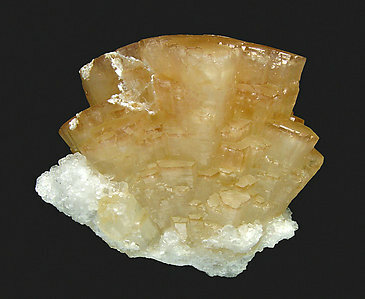 Strontianite crystals on a Quartz matrix that have the very well defined pseudo-hexagonal twin and faces and edges. Furthermore, most of them are doubly terminated. They are translucent and bright. A sample of the best quality for the species.